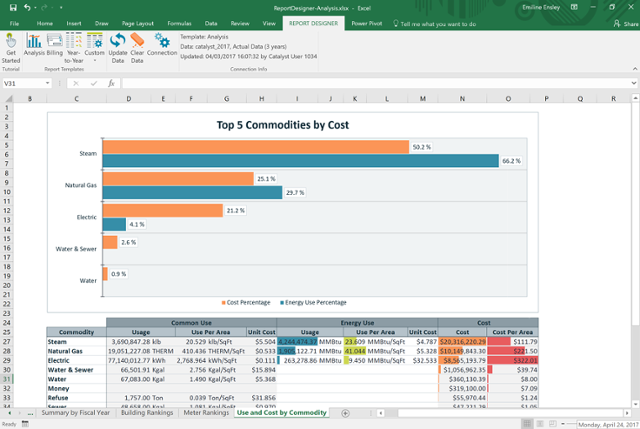 Report Designer is a Microsoft Excel® Add-in that works by importing data directly from your EnergyCAP database into a spreadsheet via the power of our expanding APIs. Installation and setup are easy. Download the Add-in and a one-time Report Designer setup sequence installs an Excel ribbon that links directly to your EnergyCAP database. A step-by-step tutorial is provided to get you started. Report Designer will connect to your EnergyCAP database, honoring your individual EnergyCAP user permissions, and you can simply use or tweak any of the report templates provided in the Report Designer library to get the data and presentation you want. If you are an Excel power user, you can use PivotTables and PivotCharts to build your own reports. You can also use Power Pivot to browse and extend the data model to incorporate your own custom data. Upload the data model to business intelligence tools like Power BI and Tableau for more advanced custom analysis and dashboards.